Are you looking for the perfect dessert for a summer family reunion or pot luck ? 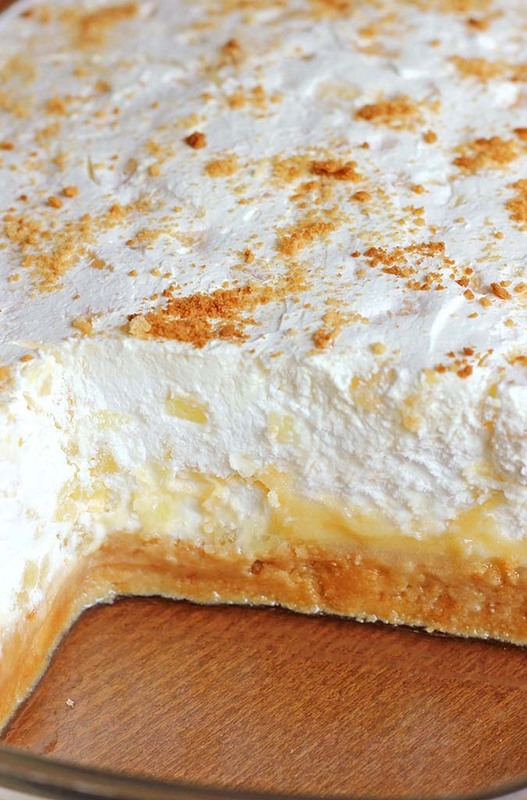 This Pineapple Delight Dessert is so easy to make and feeds a crowd. Based on the hot and sunny weather outside, temperatures start rising into the late 80s last few days, and for the weekend 90s announced ! so I guess it’s safe to say that summer is officially here! There are a few things that are 100% necessary for summer. Like a lots of sunscreen, sundresses, sunglasses, a barbecue and a “recipe for success” – That’s what we call a summer dessert. When someone thinks of a “summer dessert,” most likely cake type of dessert does not come to their mind. Usually, sweet treats in the scorching hot summer months include ice cream, popsicles, snow cones and the occasional milkshake. But all of you will agree on one thing anything that can be kept cool like uh…..ICE CREAM, is always a winner! Right ? So, please stop by for a minute and get that touch of summer and Pineapple. Pineapple Delight Dessert. The name says it all…..these are simply DELIGHTFUL! Cool, refreshing, just perfect for a hot summer’s day, or if by chance there are any leftovers it’s even better the next day. If you aren’t a big fan of pineapple for some odd reason then you can substitute an equal amount of crushed strawberries (and I am certain other fruit would work too). Preheat oven to 350. Spray an 13 X 9 pan lightly with cooking spray. Set aside. In a medium bowl, combine graham cracker crumbs and butter until well combined and crumbly. Press into prepared pan. Bake for 10 minutes, then cool completely on a wire rack. In a separate bowl, mix together butter, icing sugar, eggs, and vanilla with an electric mixer until smooth. Drop by spoonfuls over crust (once it has completely cooled), and gently smooth to form an even layer. Bake for 10-12 minutes, then remove and cool completely on a wire rack. Beat the whipping cream, icing sugar and vanilla in a medium bowl until it is thick and stiff. Drain the juice from the canned crushed pineapple. Mix the whipped cream and pineapple together and spread evenly over top of the cooled butter filling. If you want to make it a little fancier, garnish the dessert with a sprinkle of graham cracker crumbs. Cover and chill until ready to serve, at least 2 hours. I’m a bit of an old goat that has taken up cooking to stay out of trouble. Made this for my great grandkids yesterday afternoon. They finished it off at lunch today, it’s all gone and they’re giving me the old “gampa can we have more” looks and hints. I am truly honored by the your lovely comment. This really gives me inspiration to continue with blogging and food photography. I can’t tell you how these awesome photos moved me…and made my belly rumble. ;-} Beautiful! SO glad you shared with us at Weekend Potluck. Please be sure to come back again soon. This looks delicious to serve my mother who does not like chocolate. My question is do you use sweetened crushed pineapple or pineapple in its own juice? Await your reply before making. Thanks so much for the kind words, I really do appreciate it. I used non-sweetened pineapple (just in its own juice). Quick question for you. Do we mix steps 7-9 together? Thank you for posting this recipe, it looks amazing! Hi Ellen, it is powdered sugar. Sarah this looks so wonderful…I am going to make this and take it to a family reunion.I just know it will be a hit. Thanks for sharing .It’ such a gift. I want to make this for Father’s Day…is the Icing sugar just regular sugar or is it confectioner sugar? sorry missed that last post…you can delete this if you’d like. Looks delish! What size can of crushed pineapple did you use? 8 ounce or 20 ounce? I’m assuming 8 ounce. Thanks! Thanks Dawn,use 8 ounce crushed pineapple. This looks fabulous! I’m wishing I had a slice for breakfast right now! Thanks for linking up with What’s Cookin’ Wednesday! This looks great! Can cool whip be used for the top layer or does it have to be whipping cream from a carton? Thank you! Thanks Lisa,use whipping cream for a carton. Sarah I’m waiting for the crust with the fling to cool completely before putting on the whip topping, bi toward looking at the filling and the top layer looks cooked I kinda cracked through it and its still liquidy, is that normal? Will it set in the refrigerator? I put it back in the oven as I was on earned just for a few min it still looks the same I’m assuming it will set to more of a pudding texture after sitting in the fridge. Hi Clarissa.Yes,wait for the crust to cool completely. For the filling bake more of 12 min. I hopee,can you try it correct again. Whipping cream is thick cream than CAN BE whipped so that it doubles in volume. They come in cans or cartons. Heavy Cream and Whipping Cream are pretty much the same thing, The only difference: the amount of milk fat..
What is the whipping cream it called for? Is this cool whip? Hi Amanda.Cool Whip is a non-dairy cream. It is made of vegetable oil among other ingredients. Whip Cream is cream from cow. That is the main difference besides the taste. I’m allergic to dairy. Could you use Cool Whip? Yes,you can use cool whip. hi, I just made this for a church event tomorrow. Your picture looks like the whipping cream/pineapple layer looks really thick, but when I spread mine out it is just a thin layer. I did whip my cream until there was stiff peaks, so I know I did that right, so what am I missing? Thank you! Not that I expect this to last long, but how long can it sit out of the fridge? Hi,Mel.Cover and chill until ready to serve, at least 2 hours. Hi Sarah I am planning on making this tonight. could you tell me do i use heavy whipping cream or just whipping cream? You say 2 cans pineapple, what size cans? 15 oz or the smaller 6 oz? Hi,Lori I mean about 1 cup drained pineapple. My pudding layer also was very runny after 10 minutes. I left it in 20 minutes but didn’t want it to burn. It is a golden color. My crust was completely cool so I am sure that was not a factor. I do hope it will setup as it cools I am just a couple hours from serving to guests. Your recipe calls for butter. Should I use unsalted or salted butter? Hi Terra,you can use unsalted melted butter.Enjoy! Are we till baking at 350? Hi,Robert.Yes,baking at 350,10 or 12 minutes. I love Pineapple Delight….. but the frozen pineapple delight. 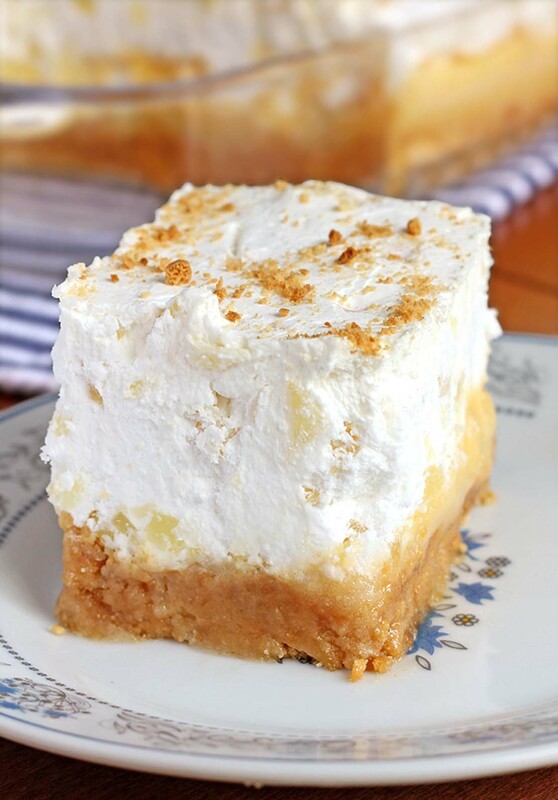 I tried this version, but it was very rich, and the middle filling layer was like sweetened condensed milk…. not at all the version my Mom used to make, which was the recipe I was looking for. If you’re looking for a frozen Pineapple Delight that is easy to make, delightfully delicious, light and airy, try the Frozen Pineapple Delight on my board. It is delicious. And the one my Mom used to make. Thanks Barbara for your advice. if I decide to try it with crushed strawberries so I drained extra juices off ojust mix all together . My mother used to make the topping and we had it served in a dish all by itself. I’ve been years wishing I had the recipe for just that. Now I do! … and more! Thank you so much and keep them coming! Thanks for posting this fab recipe.. I have had it every Christmas as a dessert since 1956. I think my original came from a very old Watkins (circa 1918) cook book. But when I went to find it.. it had fallen out some place. I was in a panic. You have pulled the fat out of the fire for me. I knew it the sec I saw your photograph. Best of the season to ya. Happy cooking. 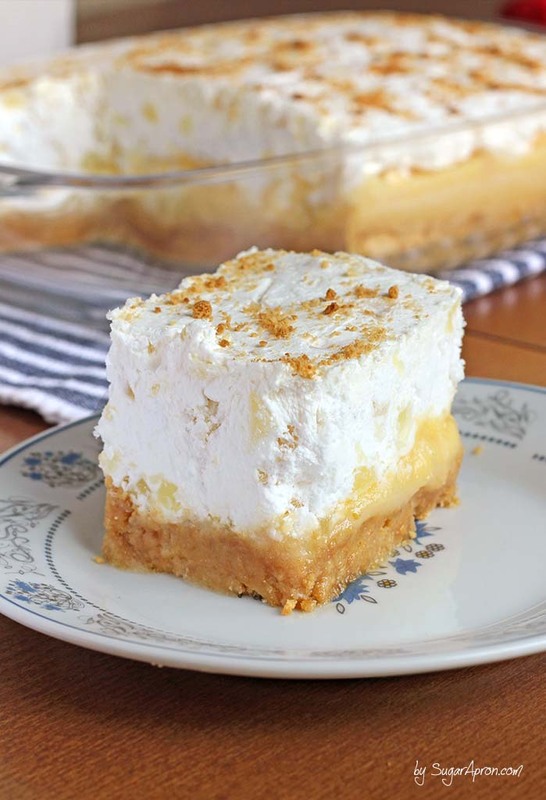 I have been making this for years, but I do only bake the bottom layer, the middle layer is just whipped then refrigerated to harden before adding whipping cream mixed with pineapple.